Author: Nwewi, H. N., Onwuka, E. M. and Ogbotubo, E.
Abstract: The study investigated entrepreneurial thinking and competitiveness in bakery industry in Delta State, Nigeria. The research adopted 20 top leading entrepreneurs at their individual location in the state.One research question guided the study and one null hypothesis was tested at 0.05 level of significance. The design of the study was descriptive survey. There was no sample because of the size of the population. A 21 item questionnaire on a 5-point response options constituted the instrument used for data collection; which was validated by experts in entrepreneurial studies, measurement and evaluation. The internal consistency of the instrument found to be 0.82. The authors personally administered a total of 20 copies of the questionnaire to 20 entrepreneurs who constituted the population for the study .The entire copies were collected and analyzed using mean, standard deviation and t-test. While mean values were used to provide answer to the research questions, t-test was used to test the hypothesis. Standard deviation provided clue on respondents’ nearness in their expressed opinions.Based on the results of the analysis of data collected, it was found that innovation is an element of entrepreneurial thinking that helps entrepreneurs in bakery industry in Delta State to gain competitive edge over others. They identified the use of modern bakery equipment, ability to offer product differentiation, ability to maintain value creation, flexible to effect changes as innovative ways that promote competitive advantage. It was recommended that entrepreneurs leading in bakery industry should continue to maintain their innovative ways and if possible improve on them, as well as good customers’ relationship as their central target. Nwewi, H. N., Onwuka, E. M. and Ogbotubo, E. (2017). Entrepreneurial thinking and competitiveness in bakery industry in Delta State of Nigeria. International Journal of Business, Management and Social Research, 04(01), 192-197. Nwewi, H. N., Onwuka, E. M. and Ogbotubo, E. “Entrepreneurial thinking and competitiveness in bakery industry in Delta State of Nigeria’’. International Journal of Business, Management and Social Research, 04(01) (2017): 192-197. Nwewi, H. N., Onwuka, E. M. and Ogbotubo, E. Entrepreneurial thinking and competitiveness in bakery industry in Delta State of Nigeria. International Journal of Business, Management and Social Research, 04, no. (01) (2017): 192-197. Author: Nzewi, H. N., Ebele, M. O. and Alaba, O. S.
Abstract: Polytechnics are bedevilled with myriads of problems that can jeopardize the attainment of their goal. Some of these problems are related to finance and equipment. The objective of the study is to examine the relationship between strategic planning and goal attainment of polytechnics in Ondo State of Nigeria. The study used correlational research design and questionnaire was the instrument used to collect data from the respondents. The mean and standard deviation were used in analyzing the data while Pearson Product Moment Correlation coefficient was used to test the relationship between strategic planning and goal attainment of the polytechnics. The findings of the study revealed among other things that there was a significant positive relationship between strategic planning and goal attainment of the Polytechnics. It is therefore recommended that the polytechnics should sustain and improve on the implementation of their strategic planning so as to continually achieve its goal in the face of challenges. Nzewi, H. N., Ebele, M. O. and Alaba, O. S. (2017). Strategic planning and goal attainment of polytechnics in Ondo state of Nigeria. International Journal of Business, Management and Social Research, 04(01), 198-205. Nzewi, H. N., Ebele, M. O. and Alaba, O. S. “Strategic planning and goal attainment of polytechnics in Ondo state of Nigeria’’. International Journal of Business, Management and Social Research, 04(01) (2017): 198-205. Nzewi, H. N., Ebele, M. O. and Alaba, O. S. Strategic planning and goal attainment of polytechnics in Ondo state of Nigeria. International Journal of Business, Management and Social Research, 04, no. (01) (2017): 198-205. Author: Korantwi-Barimah, J. S. and Schultz, C. M.
Abstract: Though universities are considered to be at the top of the transformation chain that generates the skills and competences needed in development, one of the major internal challenges faced by the technical universities in Ghana in delivering on their new mandate has been the need for building the capacity and competences of academic staff. This study, which is part of a doctorate studies, sought to examine the extent of participation of academic staff in seminars, workshops, conferences, mentoring and ICT training aspects of capacity building programmes in Ghanaian technical universities and its implication for institutional strengthening. This investigation was directed by one research question and two hypotheses. From a population of 1872 full time academic staff in the universities, 320 staff were sampled through stratified random sampling. A self-developed questionnaire was used to collect data. Data were subjected to statistical analysis with the use of descriptive statistics, Population t-test and Independent t-test. The study revealed that academic staff in the universities participate mostly in conferences than any other capacity building programme and that their participation in these programmes is significantly low. However, no significant difference exist between male and female academic staff’s participation in capacity building programmes. The study concludes that building the capacity of academic staff needs to be considered as a strategic priority improving the quality of teaching and research output among academic staff. It therefore recommends that the universities, in collaboration with other stakeholders, should provide enabling environment to support academic staff to fully participate in capacity building programmes to equip them with the required competences. Korantwi-Barimah, J. S. and Schultz, C. M. (2017). Capacity building and institutional strengthening: Ghanaian technical universities in perspective. International Journal of Business, Management and Social Research, 04(01), 206-214. Korantwi-Barimah, J. S. and Schultz, C. M. “Capacity building and institutional strengthening: Ghanaian technical universities in perspective’’. International Journal of Business, Management and Social Research, 04(01) (2017): 206-214. Korantwi-Barimah, J. S. and Schultz, C. M. Capacity building and institutional strengthening: Ghanaian technical universities in perspective. International Journal of Business, Management and Social Research, 04, no. (01) (2017): 206-214. Abstract: The study was conducted at Haluaghat upazila of Mymensingh district to identify the existing medicinal plant species, their uses and their contribution to the socio-economic development of the household. Data were collected from the selected respondents by using structured questionnaires during September to October 2004. About 90 useful medicinal species were identified; among them 30 were tree species, 29 shrubs and 31 herbs. The prevalent tree species with medicinal value in the study area were Amloki (3.20), Neem (3.13), Nishinda (2.66), Kharajora (2.56), Sheora (2.01), Arjun (1.92), Chalta (1.87) etc. Most prevalent medicinal shrub species were Cassava (4.56) followed by Bashak (2.09), Akanda (1.98), Papaya (1.67), Dhalim (1.12) etc. and most prevalent medicinal hurb species were Vat (23.80), Bonhalud (13.67), Patharkuchi (6.41), Apung (6.30), Lajjabati (4.81), Pumonava (4.74) etc. Economically potential species were Arjun, Amloki, Horitaki, Ulotkombal, Ghritakanchan etc. The relationship between socio-economic condition with selected characteristics such as age and homestead area was found insignificant; while the rest characteristics like education level, family size, farm size, overall annual income, income from medicinal plants, knowledge on medicinal plants, preference towards medicinal plants of the respondents were found statistically significant which motivated them to raise the medicinal plant species in their homestead area. From the socio-economic point of view, medicinal plants provided a critical source of income for many rural communities, especially landless poor and marginalized farmers. The plant species having high commercial value may be utilized as a source of income for the rural farmers. It was noticed that the respondents reduced health care cost by using this indigenous trees, shrubs and herbs. Moreover, the people who took kavirazi as a profession and contributed in rural health care were well known and given higher respect from the society. Unfortunately, medicinal plants are increasingly threatened by various environmental, socio-economic and institutional problems. Most of the respondents opined that their problems were mainly related to lack of land, time, inputs, proper knowledge, economic support and unwillingness to cultivate and conserve medicinal plants. However, proper training with adequate supply of desired medicinal plant species are required and credit facilities would be helpful for large scale cultivation of medicinal plants. Bari, M. R., Ali, M. A., Miah, M. G., Abdullah, M. R. and Uddin, M. J. (2017). Medicinal plants and their contribution in socio-economic condition of the household in Haluaghat upazila, Mymensingh. International Journal of Business, Management and Social Research, 04(01), 215-228. Bari, M. R., Ali, M. A., Miah, M. G., Abdullah, M. R. and Uddin, M. J. "Medicinal plants and their contribution in socio-economic condition of the household in Haluaghat upazila, Mymensingh." International Journal of Business, Management and Social Research, 04(01) (2017): 215-228. Bari, M. R., Ali, M. A., Miah, M. G., Abdullah, M. R. and Uddin, M. J. "Medicinal plants and their contribution in socio-economic condition of the household in Haluaghat upazila, Mymensingh." International Journal of Business, Management and Social Research, 04 no. 01(2017): 215-228. Author: Liao, W., Kilcoyne, M. S., Hardy, M. M. and Parker, C.
Abstract: Higher education must be able to determine employers’ workforce expectations.With the expansion of international business opportunities, the purpose of this research is to determine what current and emerging knowledge and skill sets are needed by graduates; specifically, those related to international business in order to meet the requirements and needs of Louisiana’s international business employers.Using an exploratory model, we sought to determine what international business topic areas are considered by Louisiana exporters to be important for newly graduated students.The population for the study was the Louisiana District Export Council (LDEC) members and data was collected using a Survey Monkey link. The study findings appear to suggest that the top “highest in importance” topic areas were: (1) How to Enter International Markets; (2) Politics, Law, and Economic Systems; (3) Foreign Exchange Market; and (4) Cultural Differences. Furthermore, results appear to indicate that eight NASBITE topics currently not being taught but of importance should be included in the international business course content, and among them the top 5 important topics are (1) Terms of Payment; (2)Risk Management; (3) Incoterms; (4)International Logistics; (5) Trade Finance. These findings may be used to align existing class topics or, if applicable, create new courses for the program. Future research might include surveying business and industry partners, universities and colleges who teach international business, and alumni. This assessment incorporates all stakeholders and provides valuable curriculum information needed to align our students’ knowledge and skill sets with the expectations of employers. Liao, W., Kilcoyne, M. S., Hardy, M. M. and Parker, C. (2018). Does our course content meet the employers’ needs? An exploratory study specifically related to international business in Louisiana. International Journal of Business, Management and Social Research, 04(02), 229-239. Liao, W., Kilcoyne, M. S., Hardy, M. M. and Parker, C. “Does our course content meet the employers’ needs? An exploratory study specifically related to international business in Louisiana’’. International Journal of Business, Management and Social Research, 04(02) (2018): 229-239. Liao, W., Kilcoyne, M. S., Hardy, M. M. and Parker, C. Does our course content meet the employers’ needs? An exploratory study specifically related to international business in Louisiana. International Journal of Business, Management and Social Research, 04, no. (02) (2018): 229-239. Author: Mburu, K. K., Obuya, M. O. and Kamau, M. I. W.
Abstract: This study was designed to establish the effect of green employee sourcing on environmental sustainability at Capital Fish Limited, Homa-bay town, Kenya. The study adopted a descriptive design, specifically a case study at Capital Fish Limited. Both primary and secondary methods of data collection were applied. The target population for the study comprised of 255 permanent employees, from which a sample size of 156 employees was selected. Questionnaires were used in the data collection. The data was then analyzed using descriptive and inferential statistics and presented inform of tables .From the findings, it was concluded that Green employee sourcing had a statistically significant effect on environmental sustainability at Capital Fish Limited .The study thus recommended that Capital Fish Limited should strengthen its green employee sourcing activities through green recruitment, green selection and green employee socialization so as to ensure environmental sustainability. Mburu, K. K., Obuya, M. O. and Kamau, M. I. W. (2018). Green employee sourcing and environmental sustainability at capital fish limited in Homa Bay town, Kenya. International Journal of Business, Management and Social Research, 04(02), 240-250. Mburu, K. K., Obuya, M. O. and Kamau, M. I. W. “Green employee sourcing and environmental sustainability at capital fish limited in Homa Bay town, Kenya’’. International Journal of Business, Management and Social Research, 04(02) (2018): 240-250. Mburu, K. K., Obuya, M. O. and Kamau, M. I. W. Green employee sourcing and environmental sustainability at capital fish limited in Homa Bay town, Kenya. International Journal of Business, Management and Social Research, 04, no. (02) (2018): 240-250. Abstract: Landscape IPM has been developed in several regions in Java to strengthen the ecosystem that has been impacted by the massive utilization of pesticide during long period. Therefore, this study about LIPM farm was started from September 2016 for collecting data until the finishing of the report which was fully completed in May 2017. This research aims to compare the level of risk of production and risk of income between LIPM adopters and non-adopters. Moreover, there will be analysis about the determinant factors of risk of production and risk of income in this study. The level of risk of production and income were measured by calculation the Coefficient of variation (CV). The determinant factors of risk of production and income analyzed by using multiple linear regression based on the method of multiplicative heterocedastic. The result shows that LIPM farm are proved to have a lower level of risk of production. Otherwise, it has higher level of risk of income compared to the non LIPM farm. Pest attack has significantly influenced the risk of production; meanwhile size of farm and the labour wage are the determinant factors of risk of income. Considering the results suggestions given to farmers are farmers are expected to apply LIPM altogether to optimize the benefits of implementing LIPM on the rice field. Title: ​ Examining factors that militate against small and medium enterprises (SMEs) in raising finance in Ghana. Author: Owusu, J. and Ismail, M. B. Access to finance has been earmarked as one of the critical constraints to Small and Medium Enterprises (SMEs) sector in Ghana. This paper aims at conducting an indepth literature review by employing social capital theory to demonstrate that SMEs in Ghana are militated against raising finance for their operations. Such challenges include lack of collateral, existence of information asymmetry, inadequate technical and managerial skills, negative perception of SMEs and limited access to finance. The paper suggests various ways in which these challenges can be addressed which include; the need for social capital development through network, improving SMEs information management system, enhancing technical and managerial skills among entrepreneurs anddevelopment of friendly SMEs legal and regulatory framework. Likewise, the paper suggests alternative sources of finance which include; crowd funding, business angels, boot strapping, capital market financing and financial resource building effort. The paper therefore concludes by making social network as significant prerequisite to be developed by SMEs as an effective mechanism to mitigate their financial challenges. Owusu and Ismail. “Examining factors that militate against small and medium enterprises (SMEs) in raising finance in Ghana.” International Journal of Business, Management and Social Research 04(02) (2018): 259-272. Owusu, J. and Ismail, M. B. (2018). Examining factors that militate against small and medium enterprises (SMEs) in raising finance in Ghana. International Journal of Business, Management and Social Research, 04(02), 259-272. Owusu, J. and Ismail, M. B. “Examining factors that militate against small and medium enterprises (SMEs) in raising finance in Ghana.” International Journal of Business, Management and Social Research 04(02) (2018): 259-272. Owusu, J. and Ismail, M. B. 2018. Examining factors that militate against small and medium enterprises (SMEs) in raising finance in Ghana. International Journal of Business, Management and Social Research, 04(02), pp. 259-272. Owusu, J and Ismail, MB. Examining factors that militate against small and medium enterprises (SMEs) in raising finance in Ghana. 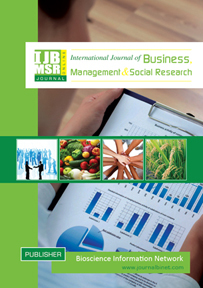 International Journal of Business, Management and Social Research. 2018 October 04(02): 259-272. Author: Horton, E., Parker, C. and Pharris, L.
As the business world continues to be shaken by the seismic sea changes in fiat currency, it is imperative that college business educators remain knowledgeable about these shifts regarding how the global marketplace has created, adopted, implemented, and is reacting to cryptocurrency, which has currently made end runs around most government regulatory schemes, and its undergirding, blockchain technology. These fluctuations are so significant that it would be a mistake for educators to turn a blind eye to this new decentralized monetary framework; thus, there exists a fierce urgency to introduce and teach the framework to business students. Otherwise, business faculty members risk their pupils falling behind in this burgeoning economic space that presentlyoffers new and varied pathways to wealth. To begin the cryptocurrency educational narrative, the researchers determined that it was essential to measure the students’ awareness of the medium prior to teaching the relevant material. With that said, this research was primarily guided by this seminal question: Do students taking this Cyber Business Law class know what cryptocurrency is, and if so, what is the extent of that knowledge? To help answer this, a survey instrument was designed and presented to the Cyber Business Law class via Survey Monkey. The data gleaned from this nascent study was then analyzed and interpreted through the lens of a qualitative systemic review. Blanket interpretations of the information revealed that the students were, for the most part, generally aware of this new technology; were more familiar with one cryptocurrency coin, Bitcoin, than other coin options; and were modestly comfortable purchasing lower-cost consumables with the medium. The researchers also discovered that for the last question of the instrument, which posed several value judgment questions to be answered on a Likert scale, the majority of the surveyed students preferred to remain neutral which likely was evidence that the topic of cryptocurrency is still relatively new to the participants, and no opinion could yet be formed by the survey taker. The next step to address in the research is to determine the extent business and industry stakeholders are gravitating to this innovative technology. For those gravitating towards the use of the technology, the research will also seek to discover what the company’s familiarity requirements, if any, regarding cryptocurrency, and possibly blockchain, are. Ascertaining said information would help strengthen the Cyber Business Law course as well as other classes in the School of Business. Horton, Eddie et al. “Student perceptions of digital currency.” International Journal of Business, Management and Social Research 04(02) (2018): 273-282. Horton, E., Parker, C. and Pharris, L. (2018). Student perceptions of digital currency. International Journal of Business, Management and Social Research, 04(02), 273-282. Horton, E., Parker, C. and Pharris, L. “Student perceptions of digital currency.” International Journal of Business, Management and Social Research 04(02) (2018): 273-282. Horton, E., Parker, C. and Pharris, L. 2018. Student perceptions of digital currency. International Journal of Business, Management and Social Research, 04(02), pp. 273-282.